wheremmsgather: What Do Snowmen Do at Night? Have you ever pondered the deep mystery of what snowmen do at night while all of us humans are sleeping? Well, apparently Lisa (aka lisa lara on Splitcoaststampers) has. She is our supercalafragilisticexpealidocious Teapot Tuesday hostess today, and, man, does she have a darling teapot for our inspiration! Furthermore, she has created an exceptionally ADORABLE card of her own for this challenge and she drew her own image!!!! I envy her talent to draw her own images. Check out the challenge and Lisa's cute card here. I hope you'll consider playing along with us. Hi, ya'll!!! I jes gots ta tell ya that I thinks snowmen wake up around midnight with all this purty purple glistening snow at their feet, as well as pink, glittery snowballs already preformed layin' about all over da place and they have this massive snowball fight until about 3:00 a.m.!! See this li'l guy here? He's warmin' up his pitchin' arm and has his 'amnition alls abouts him. He's comin' in the front door to the tea party at Santa's cottage and plans to blast a few of the tea partiers with these pink snowballs. Aw, shucks! Don't worry yer purty li'l heads off. Ain't no one gonna git hurt. These snowballs are soft, tasty and full of chocolate cake and creamy white centers! Ya see, snowmen....just afer midnight each night....go from house to house stealin' them thar pink snowball cake goodies and use them for their snowball fights! That's what happened to poor Charlene's snowball goodies that Lorraine sent her. One of them thar snowmen snuck into her house and stole 'em!! What? No, I ain't gained no weight over night. It's jes yer imag'nation. Well, that's Bertie's story and what she thinks snowmen do at night and what happened to the scrumpdillyicious pink snowball cakes that Lorraine sent to me. I swear that girl is getting fatter every day!!! Note: I drew the snowman's stick arms so he could warm up his pitchin' arm for the snowball fight. That's the extent of my drawing ability! :-) For my night sky, I ripped some post-it notes and used my sponge daubers to apply various shades of inks (my brayer doesn't like me, so I have to use sponge daubers). I can't remember the name of these tiny snowflakes, but I white embossed them. Yummy! I LOVE those pink snowballs (even though they aren't RED!). Bertie could throw a couple of them my way!!! Darling card.....the windup looks about ready! LOVE the *SPLAT* cover. What a clever and fun gift to receive Charlene!! 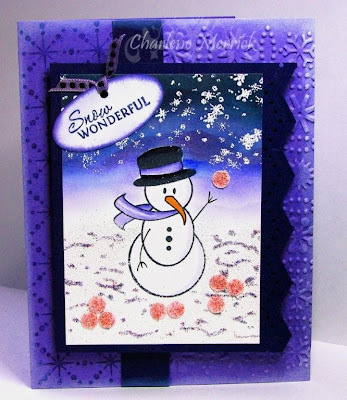 And your purple (shocker) card is charming and gorgeous!! Love your sky and your fabulously hand drawn arms!!! Darling! LOL Oh that is totally funny! 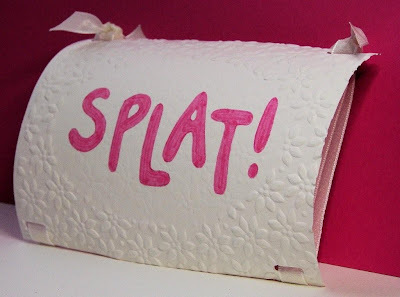 Splat... very fun. Super card, Charlene. And what a fun snowball gift! Sorry you aren't friends with your brayer, but no worries cause your sponging is phenomenal. Love the pink snowballs! !